Edgar Wallace's famous-though inconspicuous detective. This is the first volume of the complete collected stories featuring Mr. J G Reeder of the Department of Public Prosecutions. Edgar Wallace's sleuthwhose territory is the London of the 1920sis an unlikely figure, more bank clerk than detective in appearance, ever wearing his square topped bowler, frock coat, cravat and muffler, Mr Reeder is usually inseparable from his umbrella. With his thin mournful face many might mistake him for an undertaker, but appearances can be deceiving. It is the mind of Mr J G Reeder that his greatest asset and that which the criminal fraternity have most to fear. Althoughon occasionshe is not averse to substituting his umbrella for a long barrelled automatic pistol when the situation demands it! 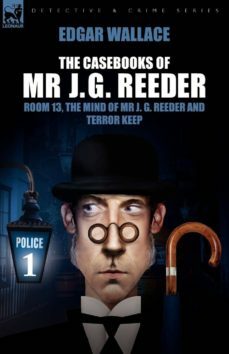 In this first volume you will find Room 13, The Mind of Mr J. G. Reeder and Terror Keepa veritable feast for detective fiction enthusiasts.